With three small drawers in the deck, our Amish handcrafted Desert Hills China Hutch wastes no space and permits both display and concealed storage. A staple to our Desert Hills Mission Dining Set, this 2-door display cabinet presents prominent Mission moulding, Walnut inlays, and authentic black hardware. 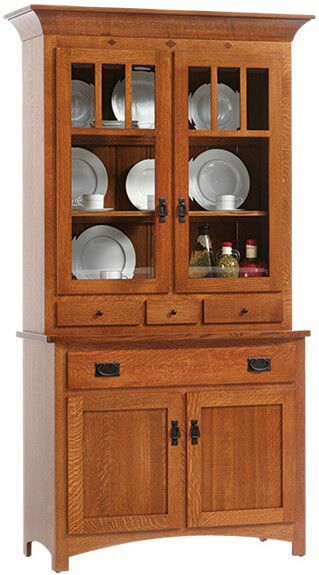 Your Desert Hills China Hutch is handcrafted to include solid tongue and groove backing, touch controlled lighting, and dovetailed drawers. The base buffet has a solid 1" thick hardwood top and concealed adjustable wooden shelves. Mission style and solid wood, your Desert Hills China Hutch is the perfect complement to your small dining space. Choose your hardwood and stain and our Amish artisans will hand-finish your 2-door hutch to perfection.